Although Lake markets their clipless winter compatible cycling boots for competition mountain bike and cyclocross use, the venerable Lake MXZ/CXZ has been a favorite among year round commuters for about the past ten years, mostly because they’ve usually been the only cycling shoes available that’s appropriate for winter use. 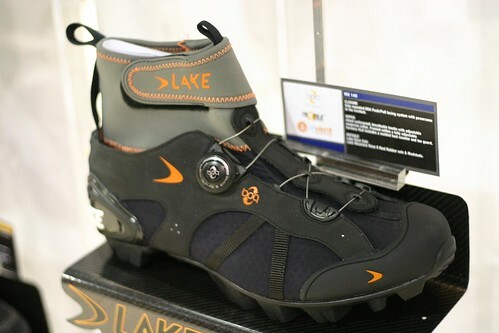 Lakes are very pricey, with the 2009 MXZ302 and CXZ302 listing at nearly $300 a pair, but those who can afford these boots love them. 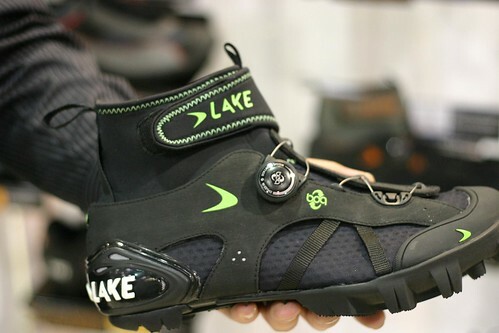 For 2009, Lake introduced several new shoes which are lighter, more flexible and more breathable than the MXZ300 line of winter cycling boots. They all feature a durable waterproof, breathable bootie made with eVent fabrics that’s framed in fully adjustable harness to hold it all together and a molded heel counter and toe guard, with an adjustable neoprene collar to keep the water from coming in through the top. The MX240C shown below has a carbon fiber sole with rubber outer sole. The CX240C is the same shoe without the rubber grips. This shoe below — the MX140 — is the same as MX240C, except with a plastic sole replaces the ultra light weight carbon fiber in the MX 240C. Not shown is the I/O 140, which features Vibram rubber sole and hook and loop strap closures instead of the BOA lacing system featured on the 240 and 140 shoes. While these newer all weather cycling shoes are lighter weight than the MXZ boots, they won’t provide quite the warmth you might need for very cold temperatures. Lake rates the 140 and 240 boots down to only 32°F / 0°C. For colder applications, the MXZ302 and CXZ302 feature a leather upper, a full insulated liner with 3M Thinsulate in the toebox, and additional insulation in the insole to keep you from losing warmth through the pedal. This is high end stuff; I’ve gotten by over the years with army surplus and backcountry gear cycling at temperatures as low as -40, but I’d love to hear from anyone who’s used Lake’s MXZ boots. Not willing to pay that coin. I have got by well with neoprene full-coverage booties, and neoprene toe-covers over regular cycling shoes wearing thick merino socks, in Toronto winters: Toronto winters are as bad as anything in the US outside of Alaska. If I lived in Alaska, Montreal, ‘Winterpeg’ or Edmonton, I’d buy the boots. I think of Toronto as a city of relatively mild winters; am I mistaken? I have a set of the regular lake winter mtb bike boots. I got a model year old off REI for 140 (300 originally). They are ubber warm on the coldest of days when mtb biking and keep the tootsie’s nice and dry when even splashing into ankle deep water. Speaking of which I should get some wax to treat them with. I expect I should get 5 or more years of use out of em. Which when looked at that way, thats not so bad. I live in Minneapolis and have the Lake MXZ302 in the wide version and love them for cold weather commuting. I still need heater packs below 10 degrees (f) and in double digit below zero I just put on my neoprene shoe covers and don’t get even a lick of cold. This is a big deal for me since my toes can go numb anytime it’s below 50 degrees. Yes they are expensive but having sold my car, they were less than one month’s car payment. I understand that not everyone can’t get rid of their car but even the gas savings from being able to ride in truly frigid weather would easily have paid for them in one season. I wrote <a href=”http://wheeldancer.blogspot.com/2008/02/lake-winter-boots-failure-to-perfect.html” this story in my blog last winter about a problem I had the perfect customer service I got from Lake. “I think of Toronto as a city of relatively mild winters.” Well, where do you live? Relative to Winnepeg, Ottawa, Edmonton and Ulan Batar, sure. I’m in Santa Cruz, California (where winter is defined as the rainy season), now, but I’m from far northern Japan and I’ve lived in the U.S. Midwest and High Plains, where the howling prairie winds combine with temperatures down to 40 degrees below zero. The average high temperature in many northern High Plains cities is lower than the average low temp in Toronto in the winter. Toronto seems to have about a Chicago climate, which is reasonable given both cities’ proximity to large lakes. I have a pair of MXZ301s that I got for $140 new from an ebay store. This was about the time the 302s were being introduced. The boots are great and with wool socks are good down to about 15F for my hour long commute. However, given the price, I was hugely disappointed when the leather upper separated from the heel box in the second season. There is a lot of force required to get these boots on, but I didn’t expect the stitching to be so weak that it failed after only about 70-80 uses. I tried to get some response from Lake but they disregarded all of my emails. My cobbler fixed the shoes for $15 and I used them the rest of the winter season without problem. I am in no hurry to rush out and buy another pair, but would be interested to hear of anyone’s experience with other winter boots like Sidi. Well Fritz, you can have bragging rights if you need them. As a side note, wind-chill is BS: Toronto, Montreal or elsewhere. Windchill – yeah, I know. There’s not much exposed skin when it’s below -20°. Lake is by far the best winter biking shoe… if you bike in the winter, you shouldn’t have anything else on your feet IMO. Now if they would just make a glove. Lake Ontario, and for arctic masses moving in from the northwest, Lake Huron, do indeed warm Toronto considerably. For example, Toronto’s coldest-ever night was -24 F (-31 C) in 1981. Gunnison had 7 nights last winter colder than (lowest -38 F) Toronto’s all-time record. Actually a town in Kansas went to -13 F last January, while Toronto’s coldest night was +2 F. Flagstaff and Santa Fe got colder than that a number of nights. Also, we think of Canada as being The Great White North, but Toronto is SOUTH of Eugene, OR, Boise,ID and the Twin Cities, not to mention the entire states of Washington, Montana and North Dakota. As latitude goes, Toronto is about 50 miles north of Milwaukee (think Austin-San Anton) and 120 mi north of Chicago (think LA-San Diego). However, they’re on the west shore of Lake Michigan, so they’re typically colder than Toronto when the arctic air comes down because Lake Michigan’s air is pushed southeastward to Michigan and Indiana. For footwear, if you don’t have 300 bucks to drop, switching clipless to platforms and regular hiking boots, oiled, with wool or neoprene socks will keep your tootsies warm. Hmmm, I’m interested in the Lake CXZ302’s; I live in Colorado. I have a pair of Lake CX201 Road shoes (summer) in size 47, which are good for thin socks or one pair of thicker socks. Should I go up one size (48) for the CXZ302’s, in case I want to wear two pairs of socks? Thanks. Pearl Izumi X-Alp Seek WRX would suit better for light touring/commuting during the rain season? I have had the Lake MXZ301s for just over a year and so I am now starting my second winter in them. I too went for years with neoprene overboots and switched to platforms pedals and snow boots below about -5C. I picked up the Lakes on ebay NIB for $125 and today, if mine were stolen, I would pay the $280 for new retail if I had to. I’ve got about 3000-4000km on them in various cool/wet/cold conditions including light touring in Holland last winter and spring in dampish 0C weather. I am currently in central Illinois and am a daily short commuter (the commute is 4km each way, I’m 187 cm) and a weekend warrior throughout the winter (50-100km on the weekends) almost (but not quite) no-matter the weather. The cost is easily justified in my mind, but I would not have said that before I owned them. Certainly if I get 5-6 years out of them it will have been worth the cash. Anyway, no quality problems so far and I do so love warm toes and clipless pedals. I was skeptical about BOA, but now really like it. With a double layer of wool socks, these will keep my toes warm for about an hour at -10C. I don’t rec ride much colder than that. That would just be masochistic. I’ve commuted in them (15 min) at -20C and been warm. it’s been around 0C here in the morning lately and I’m comfy in a regular pair of wool socks. Rain protection is good especially if I throw on some gaiters to keep water out of the top. I once got stuck in an hour-long downpour with no gaiters and they pretty much filled up. I do treat the leather now and then with SIDI brand leather conditioner that I originally got for my SIDI motorcycle boots. I’ve treated them maybe 4 times in the last year. If you have the means and you ride in the cool/cold with clipless pedals, quit waffling and buy yourself a pair. Update from April 2009 regarding leather separating from heel counters. I never heard a thing from Lake in response to my email. I got my boots repaired by a local cobbler for $10 ($5 less than anakcu’s cobbler)and have had no other problems.